Contemporary realist painter Ronna S. Harris combines a brilliantly integrative technique with a poignant sensitivity to nature’s beauty. Through her mastery of the figure, still life, and landscapes, she marries an Old-World reverence for close observation and painstaking skill with an appreciation of Modernism’s seismic impact on contemporary aesthetics. Born in California, she has a Californian’s innate reverence for the prismatic quality of light, a sensibility she has carried with her through a lifetime of mark-making and travel. Her oil paintings at Callan Fine Art distill the discrete, perfected moments she has captured in journeys throughout California, Alaska, Oregon, the Carolinas, Louisiana, and other unforgettable landscapes. Harris earned her B.A. in art and drawing from California State University and her M.F.A. in fine arts and painting from the University of California, Santa Barbara. Currently an associate professor of art at Tulane University, she has exhibited across the United States and Europe, including a 2009 installation at the Biennale Internazionale dell’Arte Contemporanea (Florence, Italy). Critics have praised her work in ARTnews, Art in America, New American Painters, The Miami Herald, The Los Angeles Times, The Times-Picayune, and National Public Radio. The recipient of numerous awards and research grants—among them a grant from the prestigious Joan Mitchell Foundation—she represented the state of Louisiana in the official art calendar commemorating the White House Bicentennial. Her work is included in prominent museum, corporate, and private collections throughout the U.S. and the world. 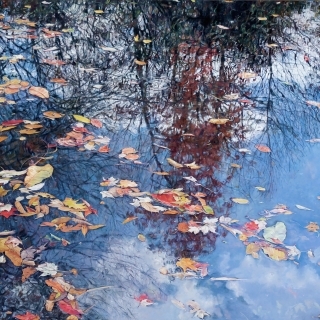 In her nature paintings Harris zooms in on the macrocosm of flowing water, pebbles, leaves, and the reflections and refractions that transmute sylvan streams into transcendentalist reveries. This caliber of interpretation demands an astute and exacting technique. “I’m bridging realism and abstraction,” she notes. “I incorporate mark-making, glazing, and variations of brush sizes and strokes that appear abstract up close—but when you stand back, it becomes very realistic.” To achieve this integration, Harris enfolds elements of Impressionism and Abstract Expressionism, imbuing representational scenes with a painterly lusciousness. Her selective deployment of encaustic medium and iridescent pigments heightens a dramatic portrayal of dappled light, lending her compositions a preternatural glow and a sense of expectant energy. The translucence of the paint imparts a layered buoyancy to Harris’ neo-Impressionist palette, transporting viewers into realms of serene contemplation.